The biggest problem when writing a Nokia N93 review is knowing exactly where to start! 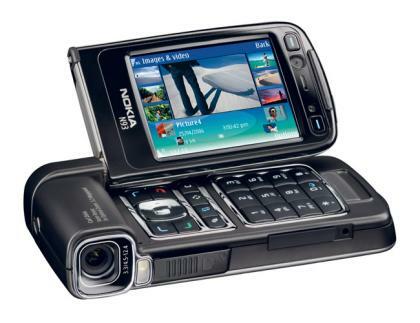 The Nokia N93 is the mother of all multimedia mobile phones – 3.2 megapixel camera, optical zoom, WiFi support, amazing video, 3G, super-twisty from factor – and that’s just scratching the surface! But despite its amazing array of features, just how good is the Nokia N93 in reality? Technical spec are one thing – how well they work in real life is another. Read on to see what the web’s best Nokia N93 reviews say about this amazing phone. The Nokia N93 reviews across the web are resoundingly glowing. Its camera is a superb 3.2 megapixeller with 3x optical Carl Zeiss lens. The photos this produces are stunning for a mobile phone (see below). AllAboutSymbian write that “…the N93 is still the best camera/camcorder smartphone we’ve ever used, by quite a margin…The N93 out performs budget digital cameras (~Â£100) in most areas and is not far short of the mid range models.” They do add the caveat, though, that no mobile phone can completely replace a dedicated camera, as the lens and CMOS on a mobile phone is just too small. 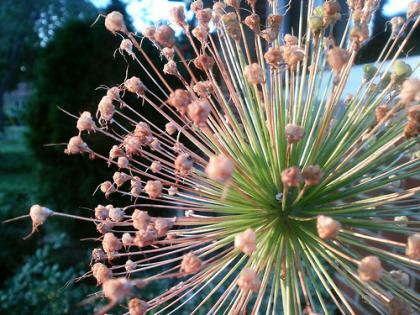 These are examples of real Nokia N93 photos – the first one’s a normal pic, the second one shows off the N93’s macro mode. Check out more at Flickr, and in particular Simon Woodside’s Photostream. 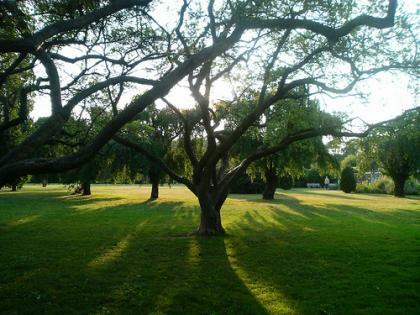 Perhaps the Nokia N93’s most impressive feature is its video capabilities. The whole device is built around being able to take good videos, with the form factor folding open like a normal clamshell, and then the screen swivelling round to give you a better view. As if that wasn’t good, though, the N93 takes videos at 30fps at VGA resolution (640 by 480 pixels) – not quite DVD quality (720 by 576), but close enough. You can even use the 3x optical zoom with the video. According to AllAboutSymbian, “…movies captured on the N93 will be fine for inclusion on home movie DVDs or for transcoding and putting up on web sites, but for any kind of semi-professional use you’ll be disappointed.” But again, it’s a mobile phone, not a semi-professional video camera, and AllAboutSymbian continue by saying the N93 is by far the best video camera on a mobile phone the’ve ever seen. Check out their review for some sample videos. Naturally the N93 comes with an MP3 player and FM radio, and as well as playing songs from the handset itself, you can also stream the tunes to your hifi for playback via a better amp and speakers. Unfortunately, this achieved by connecting your N93 to your hifi via cables, so no wireless access, but apparently the resultant sound output is excellent. As if the multimedia features of the Nokia N93 weren’t enough (and I’ve still only just scratched the surface! ), the connectivity of this device is truly mind-blowing. All the usual are there – Dual mode WCDMA/GSM and triband GSM coverage on up to five continents (EDGE/GSM 900/1800/1900 + WCDMA 2100 MHz networks) – but the N93 also comes with Bluetooth 2.0, USB 2.0, Wireless LAN, TV-Out and UPnP (Universal Plug n Play). UPnP lets compliant devices interoperate seamlessly. In the N93, UPnP means it can hook up to your UPnP-compliant TV (you have one of those, right?!) over your wireless network, and play your videos or display your pics using the N93 as a remote control. However, there aren’t that many UPnP devices out there present. To rectify this, Nokia supply a UPnP server for your PC, so you can display your N93’s pics and videos on your PC wirelessly. It’s a neat feature whose time will surely come, but is limited whilst UPnP-compliant devices are so few and far between. The TV-Out function lets you hook your N93 up to your TV so that you can view your pictures, video and even play 3D games on your TV – even if it doesn’t have UPnP. Of course, with all this technology, you can’t expect the N93 to be small or light, and it isn’t! At 118. 2 mm x 55.5 mm, and 28.2 mm thick, with a weight of 180g, it’s not exactly suitable for shrink-fit jeans. That said, it’s a high-end phone with a lot of technology, so you can’t expect it to be a thin phone. This one’s for people who love to show off their phones, not hide them away. 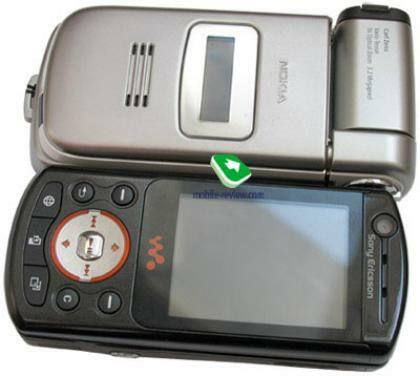 Besides, as you can see below, with the N93 compared to a Sony Ericsson W900i, it’s not that huge! If you’re still not convinced by the Nokia N93, check out this N93 video clip posted on About-Nokia.com. 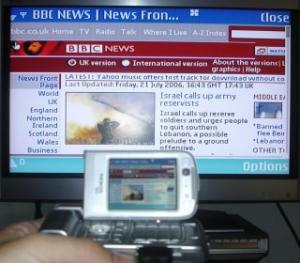 The clip shows the amazing 3D-games capabilities of the N93, with the device plugged into a TV. Truly a marevellous mobile phone! 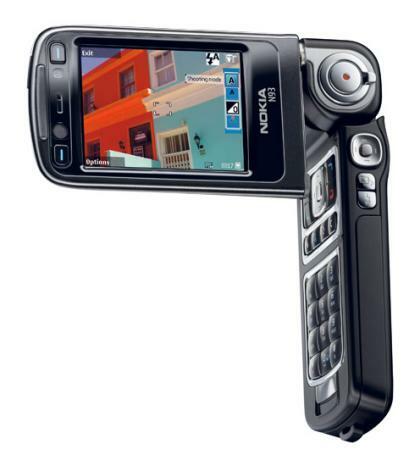 The Nokia N93 has been reviewed and rated extensively across the web. ZDNet, for example, give it an 8.8 out of 10. So the only downsides to the N93 are its size, weight and cost. But then, with so many features crammed into this mobile marvel, you’ve surely got to expect that. If you want 2006’s most advanced mobile phone outside of South Korea, you have to get the Nokia N93. In an effort to drive even more sales of the N93, Nokia have released a special N93 golf version. Finally, Nokia are basking in praise for their techno-wonder-phone, as the N93 has been awarded the European Media Phone of the Year 2006-2007 by the European Imaging and Sound Association (EISA), Europe’s largest multimedia press organization. We’ve got more specs and pictures of the Nokia N93, or for the full tech spec, check out Nokia’s official Nokia N93 site.